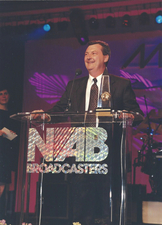 Skip receiving the prestigious Marconi Award from the National Association of Broadcasters in 2006. 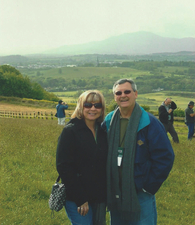 Skip and Sharon Essick in the west of Ireland in 2009. The first radio call in show ever permitted by The Vatican. September 1988. Skip’s guest was Cardinal John Foley, the president of the papal commission for social communication. The broadcast was from the studios of Vatican Radio/September 1988. 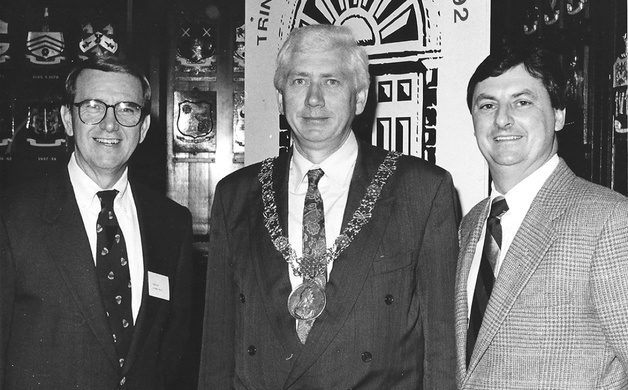 Left - Right Jack Fox with WHAS Radio Lousiville, The Lord Mayor of Dublin and Skip in 1992. Skip was awarded the gold Shamrock Award by the city of Dublin and made an honorary citizen of Dublin for promoting tourism to Ireland. In September 1988, there was a live broadcast that was the first of its kind. 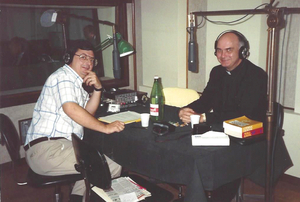 A call-in radio talk show was broadcast on location from–of all places–the Vatican! The show commemorated the 10th anniversary of the pontification of John Paul II. And who was the radio host who accomplished this “first”? Most of Fresno either recognizes his voice or his name. It is our own Skip Essick. The Vatican is a long way from Toledo, Ohio, where Skip was born the oldest of five to a strong Catholic family, but travel was to become second nature to him. This kid from Ohio was not into sports or other activities that captivated his contemporaries. Skip was actually more interested in his maternal grandfather’s interests of travel, fishing and golf. In fact, he states that his grandfather was a member of the PGA (though he never toured), and his grandfather’s 1938 golf clubs remain in Skip’s care to this day. A defining moment in his life came at the young age of 10. Uncle Lou came driving up in a “big car with a beautiful wife”–the fruits of being a popular DJ in North Carolina. That was when Skip decided that radio was to be his life. As a senior in high school, he found his first radio job in his hometown of Lima, Ohio. Upon finishing school, Skip describes traveling “to every small town that had a broadcast antenna” to apply for a radio job. He found success at the bottom of one antenna in Van Wert, Ohio, at WERT. In those days, you had to have an operator’s license to be on the radio; therefore, Skip applied to broadcast engineering school in Atlanta. WERT had other plans. They offered this young man a full-time job which, of course, trumped going to Atlanta. Election Day in 1968 was Skip Essick’s first day of full-time employment on the air. It was also the first time he ever cussed on the air! The engineer had hung a microphone in the teletype closet to pick up the sound effect of the teletype, and instead it picked up Skip’s opinion of the election results (left to the imagination of the reader). The spring of 1969 found Skip at “the big station” of WCIT in Lima and then at WGRD in Grand Rapids, Mich., where his career took off. He humbly gives credit for this to the people he worked with. Skip tells of how he knew from the start that focusing on the quality of the audio production was the secret of success and he set his standards high. He describes his favorite station as WHAS in Louisville, where “a big signal, amazing talent, University of Kentucky sports and University of Louisville sports” kept him for seven years. In 1995, he finally had the chance to work at WJR in Detroit, explaining, “I grew up in the shadow of that station” as “The Great Voice of the Great Lakes” with Detroit Tigers baseball. The task of rebuilding that station after the passing of the great J.P. McCarthy in 1995 fell to Skip. His success led him to become a general manager with Clear Channel Communications just one year later (he ultimately managed 17 stations). Unfortunately, managing a station was too far removed from the art of good radio, and Skip wanted to return to directing programming. Being older and overqualified were some unexpected hurdles, but in stepped KMJ in Fresno. Skip tells of how he formed the vision for KMJ on his first day–and that vision carried KMJ to the No. 1 spot for most of the seven years that he was the program director. New corporate ownership with myopic decision-making and a brief health issue sent Skip back to Ohio. During that transition, the job offers were many but he wanted to retire in Fresno. An unexpected surprise awaited him. It was the opportunity of ownership in KGED-AM (1680) Fresno that brought him back. west of Ireland in 2009. Skip has become known for many things, including his trips to Ireland. He tells of a DJ at WOOD in Grand Rapids who often spoke of retiring to Ireland. Every St. Patrick’s Day, this DJ would celebrate on the air. When it came time for the DJ to retire, Skip arranged for a retirement trip to Dublin on St. Patrick’s Day where DJ Bruce Grant broadcast his last show from the RET studio in Dublin. Now, after 23 trips to Ireland and taking more than 800 listeners with him, he stands to add trip No. 24 in April 2016 with the listeners of KGED. To our benefit, we are now the canvas that this radio artist is creating upon. Written by Bradley T. Wajda, D.O.